Mike Stellar: Nerves of Steel by K. A. Holt is a nominee this year for Connecticut's Nutmeg Award, which is how I found out about it. It was on the Nutmeg Shelf at my local library. 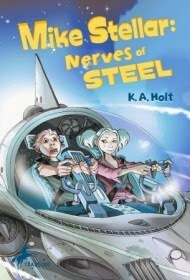 Nerves of Steel is a mystery in a science fiction setting that is more Jetsons than Hunger Games. Mike Stellar is suddenly hauled off on a space mission by his parents who were accused of being responsible for the failure of an earlier trip into the great unknown. Right away Mike thinks there's something odd going on. In traditional kid story fashion, he is all over it. I found Mike Stellar: Nerves of Steel slow getting going. And slow in other places. I hate to admit it, but I found the plot confusing in places, too. But there came a point when I did think that child Gail would have bought into a kid being able to save the day, no matter how improbable. As Charlotte of Charlotte's Library said of this book when it was published, "This probably isn't a book that will appeal to grown-up fans of science-fiction, for whom the plot and its concomitant technology might seem simplistic. But, since they aren't the target audience, so what." Well, maybe I shouldn't say "As Charlotte...said" because I didn't find the plot simplistic. But you get what I'm going for here. This book isn't for people like me. A big plus: Civilization hasn't fallen in this book. Oh, my gosh, I am so tired of post-apocalyptic misery.